Sakura Castle (佐倉城) is a hilltop castle located in Sakura, Chiba. Originally, it was built by Kashima Mikitane in Sengoku period. Later, Tokugawa Ieyasu ordered Doi Toshi Katsu to built strong castle to protect Edo from east. He built current scale of Sakura Castle in 1618. In Meiji period, this castle belonged to Japanese army and all of the buildings were abandoned. 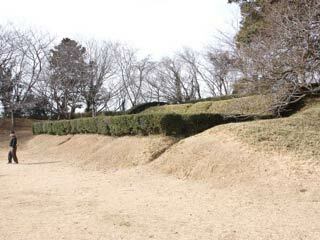 However, the moats, dry moats, baileys, and earthworks are preserved in great condition. In April, there are beautiful Cherry Blossom in this castle. Built in: Sengoku period by Kashima Mikitane. It was the capital of Sakura. Sakura sent many Tokugawa government officers. Hotta clan became the lord of Sakura earlier and later. Later Hotta clan ruled Sakura for 160 years. The castle has no stone. It Inba pond as the outer moat. Also, they have no Tenshukaku, but it has three stories keep instead of Tenshu-kaku. Currently, Honmaru the main bailey and other baileys are became play ground. In April, because there are many Cherry blossom, it becomes one of the popular Hanami spots in Sakura. The History museum is also located in this castle.